2012 August – Don't We Look Alike? The hair on the back of my neck bristled. Instantly, Mom’s arms crushed me in a protective embrace. I thought of the wonderful Filipina woman who lived with us as a helper, and the thousands of other Filipinos who worked in Hong Kong, where we’d been living for two years. “I’m Filipina,” I replied flatly. I watched the rear view mirror as the taxi driver’s eyes widened. He bumbled and fumbled his apologies but his words fell between the seat cushions—heavy, forced, and laden with deserved embarrassment. This is a busy time of year for many of us. 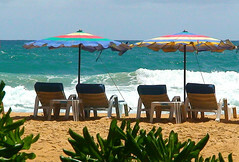 Vacations, end of vacations, back to school, back to work, the beginning of new routines and the end of others. Don’t We Look Alike? will be on break through Tuesday, September 4. We will publish past blog posts, instead of new pieces, during this time. When I first came to the U.S. as a baby, my foster family sent gifts with me, which included a couple of stuffed animals from the Seoul Olympics and a small photo album. In the album were pictures of me living in my foster parents’ home with their children. My parents showed me the pictures several times over the next few years. I remember confusing the idea of a foster mother with a birth mother, and for awhile, I thought that the woman holding me close and smiling was my birth mother. When I was old enough to understand, I was disappointed that I wasn’t related to the people in the photos. Now that I am an adult I am so grateful to my foster mother (and her family) for not just taking care of me according to the requirements of the job, but for going above and beyond in giving me the care and attention she would give her own child. The way I know that this family did so much for me is that in the photographs they documented a special celebration which means a lot in Korea. Special birthday parties for certain ages are an integral part of Korean culture. I was given a party for my baek-il before I left for America. Baek-il means “100thday” and is celebrated when a baby is 100 days old. It signifies that the baby has overcome health risks to newborns and has made it to this point. The family celebrates with generous food displays. They serve rice cakes which have different meanings, including protection, good fortune, happiness, longevity, and wealth. My foster family was of modest means. The father was a bus driver and the mother’s only income came from being a foster mother. They had three children to support. Yet they would have had to pay for the feast they provided for my baek-il. They would have paid for the gifts they sent with me. I will always be thankful for their generosity and the love they gave me for the short time I lived with them. Just imagine that you decide you’d like to add another child to your family. You know this is a huge commitment and it will probably change everyone in your family, your friends and ultimately will change your life forever. You are willing to take on this mission even though you are scared of the unknown and what you are about to undertake. Imagine, somewhere in Russia is a child rocking himself to sleep each night wondering what it would be like to have someone who could rock him, to comfort him when he was scared or hurt, someone to wipe his tears and tell him he was going to be ok. Imagine how it feels to be hungry so often you no longer understand what it means when your tummy growls. Imagine never leaving the orphanage to see the rest of the world. No car rides, no trips to the park, no McDonald’s, and no birthday parties. Worst of all, imagine no hugs and kisses, no trips to Grandma, and no one to answer your cries. Imagine an orphanage with large silent hallways. Orphanages filled with children, but no crying? They have learned that crying gets no response, and soon they no longer know how to cry. Imagine wanting to adopt one of these children, but you must fill out endless forms, sometimes repeatedly. You must have physicals, finger-printing, police checks, home studies and then fill out more paperwork. Then this paperwork must be notarized in triplicate, apostilled (proof of notary), and sent to various people on demand. Imagine doing these papers over several times to the point that Federal Tax forms look more appealing than adoption paperwork. Imagine getting the call that your paperwork has finally been seen by someone from Russia and you can finally travel to meet your child! (This happened to me while I was shopping in Wal-Mart and I burst into tears!) Imagine having one week to make airline arrangements, child care arrangements, etc. to travel across the world to meet your child. You frantically make arrangements and before you know it you are traveling to Russia. Imagine traveling and traveling…trains, planes & automobiles of traveling. Thirty hours of traveling to meet your child. Now imagine you are finally sent to a small green room in this old, run down Russian orphanage where you wait for someone to bring in your child. You begin to wonder why you are there. Why are you doing all this, to the point of exhaustion? You have done a mountain of paperwork, paid more money than you had ever planned on and traveled to a part of the world that is full of poverty and despair. But suddenly, the door opens and a large Russian woman walks in with a small, thin little boy holding her hand. He is smaller than your birth son was at 3. Is this really the 5-year-old we have been waiting for? He has the little face that has been hanging on your refrigerator for the past six months. She takes him to you and tells him, “This is your Mama.” You take him in your arms and hug him tight. You notice your husband has tears in his eyes as he picks up this very tiny 5-year-old. At that moment you know this little guy is your son. You know you are changing his life forever. He now has hope for a good life, an education, better health and a forever family to love him and care for him. All the frustrations you have experienced to this point have melted away as this little guy hugs his Papa’s neck and giggles. You play outside with him and his friends in the orphanage. They hug you and call you Mama and Papa. Most of them will never know what a real Mama and Papa are, though. You know you have to do all this traveling again in a few months, but this time to bring him home to your family and friends. You will discover that not only have you changed his life for the better but he has changed how you look at life from now on. The day may come, like it did for me, when your child looks you in the eyes and asks, “Mama, what took you so long to come and get me? I was waiting and waiting for you.” It broke my heart to think he was waiting for us all that time. If you experience all this then you will be able to imagine what it is like to adopt a child from Russia. Debbie Mumm lives in Grayslake, IL with her husband and 5 children, two of which were adopted from Russia in 2004. She is an adoption coach with a local adoption support group as well as an online group. Claim a FREE report at http://www.adoptionhighway.com to see how you can help orphaned children. 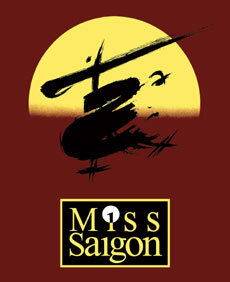 What Does “Miss Saigon” Have to Do with It? Most of the CDs in my collection are Broadway musical cast albums. From the time I was a preschooler, I’ve listened to show tunes, first learning them from my mother’s LP collection of 1950s show classics. The one recording from any era that moves me every time I listen to it is Miss Saigon. From “The Movie in My Mind” to “Sun and Moon” to “I’d Give My Life for You,” the music makes me cry. I’ve seen a touring version of the show, as well as a professional show, which my daughter was in, in Wichita, Kansas. Those productions really brought home how unfortunate it is that Miss Saigon is one of the few musicals available for Asian actresses. Except for the young woman playing lead, all the Asian girls in the play portray prostitutes and pole dancers, strutting across the stage in bikinis. Enough to have been born Asian. While the character singing bemoans the fact that she plays the token African-American character, at least she gets to stand and sing “the soul” with dignity. So would I be happy to see Marisha in the show again? Certainly! I love seeing Marisha happy doing what she loves. And although it’s sad that Miss Saigon is the only real opportunity for a mainly Asian cast, I do love the show. As I said, it makes me cry every time I hear the music. Trying to figure out why the show affects me so deeply, I realized that, for me, the American mother of two children born to Korean women, the story of Miss Saigon operates as a tale of adoption. Now, if you’ve seen the show, you know that the main character Kim and the American soldier Chris fall in love during the war and are separated during the fall of Saigon. Afterward, there is no communication and Kim bears Chris’ child–a child he doesn’t know exists–and Chris marries an American girl, usually played by a white actress. Kim wants her son Tam to go to America for what she believes will be a better life than she is able to provide for him. Otherwise, Tam, left behind with his mother, now in Bangkok, will suffer the fate of an Amerasian child. The song “Bui Doi,” offers a heartbreaking explanation of how poorly these children, “the dust of life,” are treated. Kim wants Chris and his wife Ellen to take Tam. To make this happen, Kim commits suicide so that Chris will not feel that they are taking the child from his mother. This also frees Ellen to love Tam because he’s no longer tied to a living mother in Vietnam. None of this sounds like adoption, except that if Chris and Ellen take Tam back to America to raise, with Kim gone, Ellen would be able to adopt Tam. No mention is made of adoption in the show. I’ve never heard anybody talk about Miss Saigon as a show about adoption. But when I watch the show, when I hear the songs, that is what I am feeling. I know that Ellen, the privileged but sympathetic American who knows nothing of the hell of Kim’s life, is my double, and I feel for the situation she is in. But most of my empathy is with Kim, who has been living with the fruits of her love for Chris, who has been carrying the burden of knowledge, and who desperately puts her love for her son ahead of the value of her own life. 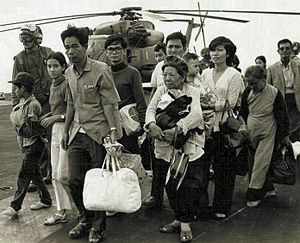 When I cry while listening to Miss Saigon, it’s not because I don’t notice that the story underscores the exploitation of Asian women during the Vietnam War and the Korean War. It’s not because I think it’s okay that Asian American actresses are “given” this one show “dancing on a pole.” It’s because it brings out my feelings of sadness for the type of situations which have allowed me the privilege of being a mother to my amazing Korean kids. Luanne’s most recent post can be found here. Mirror Mirror in the City, Who is Better, Fair, and Pretty? For most of my life, I was used to being the only Asian girl in my group of friends. Growing up in a mid-size town in southern California, my friends were an eclectic group composed of people of different races, but I usually didn’t have other Asian friends to relate to. In high school there weren’t many Asian girls, and in elementary, even fewer. Since moving to LA, I have noticed that there seems to be a stigma about being “Asian” here. I cannot argue that it doesn’t exist because in the entertainment and performing businesses, we do seem to get the short end of the stick. Because of the stereotypes and limited opportunities for casting, the negative side of competition seems to pop up between Asian girls. This is not always true—bless my newfound Asian female friends for their support. However, it happens too often. It took me some time to realize this. After I first moved here, I went out to a club one night with some friends. My good friend suddenly nudged me. “Look! That girl keeps staring at you.” My reflex was to look right at the girl referred to. She glared at me, then purposely looked me over good and rolled her eyes. This wasn’t the last time that has happened. When I try to talk to or compliment another Asian girl when I’m out, she will generally walk away. Worse yet, it also happens at auditions. Sometimes there aren’t any other Asian girls at a particular audition. But when there are a couple of other Asians, too often I receive evil looks and judgmental energy. I don’t understand this. We should be uniting and accepting of each other. Nothing makes me sadder than when other Asian girls in LA stare me down, size me up, and look for any reason to believe that they are “more American” than me. Or just better than me. Is it because we all believe that the opportunities are slim here? Or maybe it is insecurity within us? It baffles me. My experiences with other Asian performers and non-performers who I have gotten to know have always been comforting and rewarding. I love connecting with Asian girls with no competition, no concern about stigma. Since moving to LA, I had the good fortune to be in a production of The Joy Luck Club with a mostly Asian cast. It was such a rewarding theatre experience. I find myself asking the question: “why are we more judgmental to people who are the closest to what we are ourselves?” I wish we could support each other instead of trying to be the only one of our kind. Although I love being the “token Asian,” I will always be proud of my race and other girls like me trying to pursue the same dream. I realize some people might view this as “girls being girls.” People of all races and personalities experience the negative side of competition. Am I overly sensitive to this? Paranoid maybe? Is it because I never experienced this type of competitive behavior when I was the “token Asian”? Or is it just reality?